I put milk chocolate to the test! Last but not least is the famous Hershey's milk chocolate. I left this one to last because I didn't think this one would be too memorable. I thought of it as a cheaper commercial grade chocolate but I was pleasantly surprised by the depth of flavor. Hershey's milk chocolate was the only milk chocolate bar that actually tasted like chocolate and not just milk and sugar. My mom and sister, Leslie, helped me in the taste testing and without knowing what kind of chocolate she was tasting, my mom guessed Hershey's. It really has a distinct chocolate flavor. This is definitely the perfect chocolate for a smores. So, what does this all mean? If your Valentine loves chocolate and you are wanting to buy him or her some this year, I would suggest buying dark chocolate. If you have a sweets lover on your hands, then he or she would probably love any of these. Choose which one of these sound appealing to you and enjoy! Today I demoed my White Chocolate Bread Pudding recipe from my cookbook on the WLOX news. I like to serve the white chocolate bread pudding with a white chocolate sauce and fresh raspberries or a raspberry coulis (sauce). I could not get raspberries fresh or frozen at my local grocery store. I decided to stop at a grocery store on my way to gulfport to buy raspberries. As I got closer to the news station, I did not see a grocery store around. I didn't want to serve the white on white dessert by itself without a pop of color. I drove to a gas station just past the news station to look for anything that I could use. I put my creativity to work in the convenience store. I looked for anything berry related from jellies to juices. 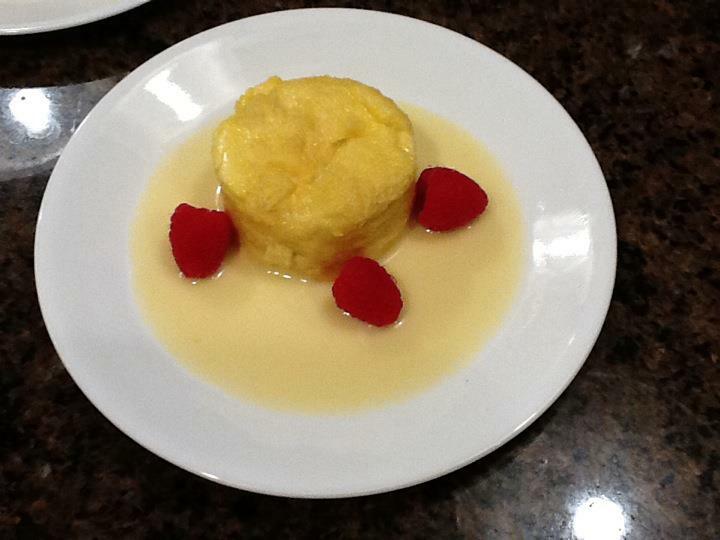 What do you think I used to give my bread pudding a pop of color and elegant presentation? Write in the comment section of my blog about what you think I used from the convenience store. 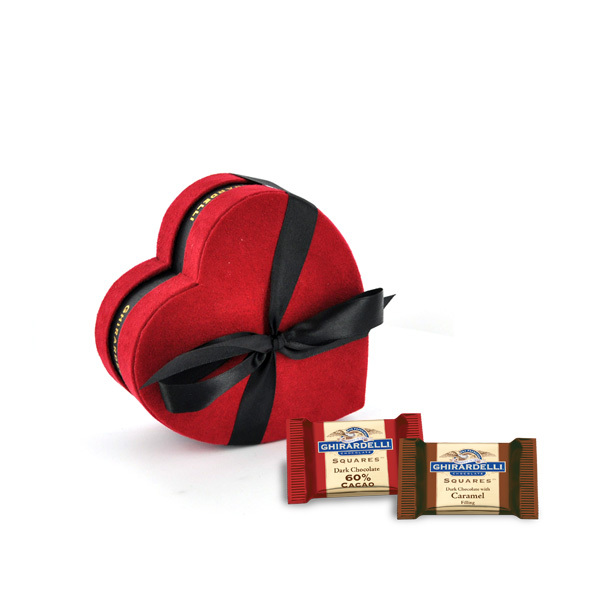 A randomly chosen person will win a Ghirardelli heart box of chocolate squares. Perfect for your Valentine! Contest ends Friday night at midnight. To portion control this dessert, spoon the bread pudding mixture into 2 greased muffin tins. Bake the bread pudding for 20 minutes. Allow to cool slightly then run a knife around the individual bread puddings and transfer to dessert plates. Enjoy! Sometimes bread pudding can be thought of as a “heavy” dessert. My recipe with its special ingredient of light and airy French bread is not the usual “dense” bread pudding. And, the taste of delicious custard and warm white chocolate sauce will leave you wanting more! Preheat the oven to 350 degrees. Grease a 13x9- inch glass baking dish. To make the bread pudding: Place the bread cubes on a baking sheet and bake for 8-10 minutes or until golden brown. Transfer to the baking dish. Whisk together the whole eggs, egg yolks, and sugar in a large bowl. Combine the half-and-half and 1 cup of the heavy cream in a medium saucepan. Heat over medium heat until hot, about 7 minutes. Whisking constantly, slowly add hot milk mixture to the egg mixture. Melt the white chocolate with the remaining 2 Tbsp. heavy cream in a small saucepan over low heat. Pour the white chocolate into the egg mixture, stirring occasionally. Stir in the vanilla. Strain the mixture through a fine-mesh sieve over the bread cubes. Lightly press the cubes into the milk mixture to submerge them. Bake until the bread has absorbed the liquid and is lightly toasted, about 40 minutes. Let stand for 5 minutes before serving. To make the white chocolate sauce: Melt the chocolate with the heavy cream in a medium saucepan over low heat, stirring occasionally. Serve the bread pudding warm with white chocolate sauce drizzled over the top. Fishing for Some Good Recipes? I am always interviewing people that I meet whether at the nail shop, grocery store, etc. about what kinds of foods he or she likes to eat, what kind of recipes he or she would like more of, etc. While getting my nails done last week, I asked the guy painting my nails what he likes to cook. He said he likes to cook fish but he doesn't know how to flavor or cook fish except a couple ways. This got me motivated to create a fish recipe. My go-to fish is catfish mostly because it easy to come by where I live. I wanted to take catfish which is a flaky fish that takes on flavor easily and infuse the most flavor into it. I did this by marinating it and baking the catfish in collard green leaves. In a large zip top bag, mix together all of the marinade ingredients. Place the catfish fillets in the bag and shake to coat the fillets. Seal and refrigerate for 1-2 hours. In a glass baking dish, place each catfish fillet in the collard green leaf. Fold the two sides of the collard green leaf down and then fold the top and bottom sides down. Place the folded side down in the baking dish. Repeat with the rest of the catfish fillets. Bake the catfish fillets for about 16-20 minutes. The catfish is done when the fillets flake apart with a fork. I would recommend serving the catfish with rice, a slaw and/or potato salad. Make this catfish dish your own by using spices you have on hand or that you like. I love putting my cooking skills to the test. The past couple of weeks I have been in the kitchen with my mom creating plan-ahead meals that are both simple to prepare and economical. The protein of choice was chicken. For $6.30, I got 4 on-the-bone chicken breasts. You get so much more chicken for the money compared to buying skinless and boneless chicken breasts. As I was deboning two of the chicken breasts, I showed my mom what is called the chicken tender. If you don't know, there is a slim piece of chicken located under the breast which is called the "tender". Using the two breasts, I cubed the raw chicken and then marinated them in Indian spices. I put a little Southern twist to the marinade by using buttermilk instead of yogurt. The inspiration for this dish came from a trip to Little India in New York; I was with my mom and we had eaten at a wonderful Indian restaurant on the recommendation of an acquaintance. Afterward, we discovered a spice market near the restaurant. I was like a kid in a candy store and couldn't resist buying several spices and spice blends. I used a Chicken Tikka Masala spice blend for this recipe. The spice blend cost $6 for a 3 ounce package. I only used 2 Tbsp. for this recipe which at the most is 1/6 of the package, about $1 for the 2 Tbsp. The spices in the packet included the following: paprika, coriander, red pepper, cardamom, onion, garlic, cumin, black pepper, ginger, mace, and fenugreek leaves. Fenugreek leaves have a celery like flavor. I am gradually building a spice collection so that I can put together more of my own blends (I love to be creative and make them my own.) Also, even though these sound like a lot of spices to make an Indian dish, these same spices are great to use in marinating proteins and seafood. In addition, many are used in my own blackening and BBQ spice recipes. After researching fenugreek leaves, I learned that the flavor was similiar to celery. Sometime in the future, I am going to try cutting the leaves off of celery stalks and drying them to use instead of fenugreek leaves. (I will let you know how it turns out.) To save money on spices, search discount places such as Big Lots, Ross, TJ Max, and Marshalls. World Market offers a large variety of spices at a reasonable price. 2 chicken breast, deboned and cubed about 1-1 1/2"
Combine all of the ingredients together in a plastic zip-top bag. Refrigerate for about 2 hours. In a large cast iron skillet, saute the onion in olive oil over medium heat for 4 minutes. Stir in the tomatoes, spice blend, and chicken broth. Reduce the heat to med-low and cook for 8 minutes. Stir in cream, half-and-half, ground almond, and chicken. Cook for about 16-20 minutes or until chicken is cooked, stirring occasionally. Season with salt to taste and serve. The tomato cream sauce is so good! I understand how naan bread is used to eat many Indian dishes. My family and I wanted to sop up the sauce (it was finger licking good). In the South, a type of gravy or sauce can be seen served over rice. My mom and I decided that a rice cake, similar to a grit cake, would be a unique way to serve the rice. Bring the two broths to boil over medium-high heat. Stir in the rice. Reduce the heat to low and cook for 15 minutes or until the liquid is absorbed and the rice is cooked. Pour the rice into a medium bowl. Add the beaten egg. Stir. Add the salt and pepper. Form the rice into about 3-inch patties. Pour the panko bread crumbs onto a plate and season with salt and pepper. Coat the patties in the panko. Heat a cast iron skillet over medium heat. Add enough canola oil to barely cover the bottom of the skillet. Once the skillet is sizzling hot, place the panko coated patties into the skillet. Cook one to two rice cakes at a time for about 1-2 minutes on each side. Carefully transfer the rice cakes onto a paper towel-lined plate. Add more oil and repeat the process with more rice cakes. Be creative with mix-ins such as diced mushrooms, chopped green onion, etc. Rice is a great item to add to any meal because it is cheap. It doesn't have to be just rice though. With a little creativity, my mom and I have transformed boring rice into a crispy rice cake. To accompany this meal, I cut broccoli crowns into florets. My mom then cut the stalks into strips. (Tip: The stalks are often thrown away, but if they are peeled and cut, they are great to incorporate in dishes.) To prepare, heat a non stick skillet over medium heat. Add 3 Tbsp. olive oil, 2 garlic cloves, crushed, broccoli, and salt and pepper to taste. Cook until the broccoli just becomes fork tender. This whole meal cost about $9 to prepare. I already had the spices. I used half of the package of chicken which cost $3.15. I already had the rice and I only needed 1 cup of the jasmine rice. The individual broccoli crowns were cheaper than buying a large head of broccoli. My family loved the meal! My sister and my dad were able to prepare their lunches for the next day with the leftovers. So the $9 meal fed 4 ppl dinner and 2 lunches. I added spices to the other two raw on-the-bone chicken breasts, drizzled olive oil over the chicken, and added chicken broth to the bottom of the glass baking dish. I baked the chicken that night to use for dinner the next day. The writing and posting of this blog was delayed because of my little helper. John Michael, my nephew, decided he would help me type my blog and hit a key that locked my cursor. After panicking for a few minutes, I called Dell for support. Thirty minutes into the phone call, I was talked into believing that the simple problem was a huge problem that consisted of a virus, software defects, etc. This can be all simply solved for the small price of $400. What? Excuse me but did you not hear me say that my nephew pressed a key and the only problem I am experiencing is my cursor being stuck. I would have just hung up but I had given him access into my computer to "fix" the problem. I am surprised I was left with any hair on my head after the conversation because I wanted to pull it all out. This stress was not worth it. I got off the phone and called a guy who is great with computers, and he fixed my stuck cursor by simply pressing a lock/unlock button on my keyboard. Are you kidding me? That was all it took! Thank you Lord for taking away my worries and solving my problem. And this is where my blog began, I have walked in the shoes of my older sister, a new mom, for the past two days. I have stayed in the kitchen more than ever and not for cooking purposes but warming up bottle after bottle for my nephew. My beauty sleep has consisted of a beauty baby staring at me while I feed him his early morning bottle. These shoes are hard to fill! I have learned how to creatively design menus based on transforming one protein into multiple meals. Yesterday, I bought two whole chickens for $8. The first chicken I roasted for meals this week and the other I froze for another week. I rubbed spices under and on top of the skin, stuffed the cavity with lemon and herbs, and placed cut vegetables in the bottom of the dish. Wash and pat the chicken dry. Place in a 8x8-inch glass baking dish. For the rub, mix lemon-pepper seasoning, garlic powder, ground thyme, and sea salt in a small bowl. Rub spice mixture over the outside and under the skin of the chicken. Stuff the cavity with the lemon, bay leaves, sage, and the tops of the celery stalks. Drizzle the olive oil over the top of the chicken. Place the vegetables in the bottom of the glass baking dish. Place in the oven and reduce the heat to 400 degrees. Bake for an hour and a half, basting the juices from the chicken halfway through the baking time. I baked the chicken in the morning and gave my dad the drumsticks along with some roasted vegetables from the night before for his lunch. For dinner, I sliced the chicken breast and served it with a turnip au gratin and Southern layered salad. Then for lunch today, my mom and I made chicken quesadillas. We served with it a pea guacamole. For more creative ways to use your roasted chicken, check out my upside down chicken potpie and southern Zuppa recipes in my cookbook. I have wanted to experiment for a while on making pulled pork using a pork tenderloin. What I love about pork tenderloin is that it an economical choice. I bought a package of pork tenderloins at the grocery store for $11. I have bought them for cheaper than that before too. A package includes two tenderloins. This is a steal because that could mean 2-4 meals for a family of 4. In my cookbook, I bacon wrap a pork tenderloin and top it with a cranberry-rosemary glaze. The pork tenderloin is so filling that a small piece is all you will want. I have served one bacon-wrapped pork tenderloin to 5 people and there were still some left. Amazing! With paper towel, pat the pork tenderloin dry. In a small bowl, combine the next six ingredients. Rub the spice mixture on the pork. Add the canola oil to a large cast iron skillet. Heat the skillet over medium-high heat. Once hot, place the tenderloin in the skillet. Cook for about 1 on each side to form a crust and seal in the flavors. Remove from heat. Top the tenderloin with the onion slices. Pour the apple juice in the skillet then cover the skillet with aluminum foil. Bake for 8 hours. Allow to cool for 5-10 minutes. Using two forks pull the pork apart. Let me introduce you to hickory smoked salt if you are not familiar with it. I discovered this salt after reading an article in Southern Living magazine. It was a little difficult to find but I have found it at specialty kitchen stores and health food stores. What I like about it is that it imparts a smoked pork flavor but with out the fat. I use this spice to flavor my sauteed brussel sprouts, leek, and green apple dish. What is simple about this preparation is that I put the pork in the oven at night and woke up to an amazing aroma coming from my oven. The pork was ready. Now for the best part! I got two meals for four people with this one pork tenderloin. That is about $2.50 per meal. I cut the amount of pork in half. For lunch, I added my favorite bbq sauce to the meat for bbq pulled pork sandwiches. Then for dinner, I served the pulled pork in a taco form. I call it Southern Carnitas. I served the pork in a homemade thin corn cake. Pork tenderloin is not only an economical choice but it is also a healthier choice because there isn't any fat on it like a picnic pork shoulder. I don't have to remove the layers of fat and pick out the meat. All you have is the flavorful pork. Try this recipe and share with me what you think. Enjoy! As I was eating my "nutty" acorn squash muffin this morning, I was thinking about my family. What I love about my family is that we can all be a little nutty. Let me give you a sneak peak into our nut house. Ha ha! My dad loves watching Swamp people and Storage wars. It is on our tv so much that my family has adopted some of the popular saying. You can't say yep in my house without my dad following it up with a Yuuup! I love the auctioner's wife and how she says folks. She says it all the time on the show. It is one of my favorite things to say especially when I imitate her. ha ha! My dad got a swamp people shirt from someone at his work and on it is Troy's popular quote which is choot em' (shoot it). What do you guess but that my dad loves to say this as well. haha! It is quite comical. Impersonations are my dad's specialty. since I was a little girl, my dad would do donald duck, goofy, elvis, and other personations. It always made my sisters and I laugh. When my parents, sisters, and I say that we love each other, we say I luv you. It isn't pronounced love but luv. We don't get off the phone with each other without saying it. We have a closeness that I wouldn't trade for anything even if we are all a little nutty. Haha! I hope you have a great day! If you can spend some time with your family today, do something fun or just sit around talking and laughing. Preheat oven to 350 degrees. Line a muffin tin with 11 muffin liners. Set the melted butter aside to cool slightly while you mix the dry ingredients. In a mixing bowl, mix together the flour, sugar, salt, baking soda, baking powder, and cinnamon. In another mixing bowl, mash the baked acorn squash until smooth. Beat in the egg with a whisk. Add the slightly cooled butter, whisking constantly. Whisk in the buttermilk, milk, agave, and vanilla until incorporated. Using a rubber spatula, fold in the dry ingredients in 3 intervals into the wet. *Folding the ingredients in will help to produce a light muffin. Do not over mix! Using a ¼ cup measuring cup, fill the muffin liners with batter. To prepare the pecan topping, mix together the butter, sugar, cinnamon, and pecans in a small bowl. Divide pecan topping amongst each muffin. Bake muffins for about 18-20 minutes. Allow to cool for 5 minutes. Enjoy! These are not too sweet so you can sprinkle cinnamon and sugar on top after the pecans. Also dried cranberries would be great mixed into the muffins. Begin your new year with a fresh and organized start! Begin your new year with a fresh start! My mom and I worked on making our kitchen more functional for quick and easy meal preparation. Accessibility is everything! We added a utility cart to organize and store appliances, tools, and ingredients like potatoes and onions. By hanging a paint roller drip tray on the side of the cart, we could hang hooks to store mearsuring cups and spoons. This is very important to me because it cuts down on the amount of time I would be looking for these items in drawers. By storing some of my appliances on the cart, I can free my counter space for other items. I stored my highly utilitzed dry ingredients of sugar, flour, and cornmeal in large glass canisters. I also have my cookbooks in easy access. On my both sides of my stove top, I have items that help me bring my meals together easily. On the left, I have my cutting board, knives, and wooden spoons. On the right side, I have a silver tray holding a glass container of sugar, a glass dish of sea salt, a pepper mill, and a three piece glass divider storing my oils of olive, pecan, and canola. I absolutely love my oils right at my fingertips. My newest addition to my kitchen is my refrigerator. Today my refrigerator was delivered and I can't wait to organize all of my produce, condiments, etc. into it. Out with my parents 17 year old refrigerator and in with this stainless steel beauty. I am especially excited about the refrigerator drawer. It is like Christmas all over again for me! Luck and Prosperity for 2012! Do you and your family enjoy the tradition of eating black eyed peas, cabbage, and sometimes ham and cornbread on New Years? I grew up with my mom preparing my family this meal on New Years. I love black eyed peas and field peas so much that I put a recipe in my cookbook. I used field peas but you can substitute them for black eyed peas. To me, the difference between them is in the texture. Field peas are creamier. The braised cabbage is so flavorful because the cabbage soaks up the chicken broth as it cooks. This year I actually prepared "little cabbages" brussel sprouts this way. Along with ham, I had to make my crunchy and moist castiron jalapeno cornbread. I placed a pat of butter on my slice of cornbread and took a bite. I got a surprise ha ha! While I was eating it, it was like biting into popcorn. There were bits of crunchy pieces and not in a good way. So what happened was...when I was making the cornbread, I used a combination of fine and coarse cornmeal unlike what my recipe calls for which is just the fine. Adding the coarse cornmeal was a bad choice lol. Lesson learned! Overall, the meal was great and it brought a few laughs. Hopefully it will bring my family and I luck and prosperity this year. I have never been one to say I am lucky. I say that I am blessed which is so true and speaks to my faith.